Yamaha: Ahead of the curve for 130 years | What Hi-Fi? Which is the only hi-fi and home cinema manufacturer able to equip an entire symphony orchestra with instruments? Or the only such manufacturer to have one of its products played by a Las Vegas star, or that can hand-build you a custom-made guitar? Well, those three tuning forks that form the Yamaha logo (see them now?) are no coincidence. Music has always been right at the heart of the company. It all started in Hamamatsu, Japan, 130 years ago, when a travelling medical instrument repairer was asked to have a look at a broken reed organ in a local school. From that experience, Torakusu Yamaha realised that Western music was growing in popularity in Japan, but all the instruments had to be imported – so he set up a business to make them locally. Today, the company he founded accounts for more than a quarter of all musical instruments sold worldwide, from pianos to violins, and from trumpets to handcrafted guitars. It’s an official supplier to the Vienna Philharmonic Orchestra, and built Elton John’s famous Red Piano for his long-running Vegas show of the same name. He liked it so much he went on to work with the Yamaha craftsmen in the Hamamatsu factory to build the Million Dollar Piano for another Las Vegas run. Those roots in music continue to inspire everything it does, from enabling the craft of world-famous music schools to creating its range of cutting-edge hi-fi and home cinema equipment. 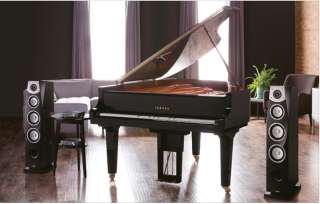 Yamaha knows that, just as someone choosing one of its instruments does so to enhance their playing, so hi-fi and AV equipment buyers are looking for quality of design and manufacture, and the performance to make the most of their favourite music and movies. That’s as true whether in a sumptuous dedicated home cinema room, or all around the house using its MusicCast wireless music system. And for 95 years, Yamaha has been making home entertainment products. In the 1920s it branched out from its organs and pianos with its first hand-wound gramophone, meeting demand for the then-new records that were taking over from the very early cylinders. In 1954, its latest record player not only found a home in many broadcast studios, but also defined a term familiar worldwide – the Yamaha HiFi Player was not only the company’s first hi-fi product, but also the first time the abbreviation for ‘high fidelity’ was used. So it can be safely said that Yamaha ‘invented’ hi-fi. Looking at the company’s hi-fi and home cinema products over the years, it’s clear to see not just the close relationship between the instrument and home audio divisions, but also the adherence to the company slogan of ‘Creating Kando Together’ – the Japanese word referring to a state of inspiration. Each side of the company informs and inspires the other. For example, the woofer unit used in the NS-20 speaker of the late 1950s was designed using principles derived from work on the soundboard of grand pianos, to create better sound dispersion. Yamaha engineers aren’t afraid to try new technologies – and even invent a few of their own – to get the best possible performance. In 1974 they not only discovered how ultra-light beryllium could be used to make faster, cleaner tweeter drivers for loudspeakers, using a vacuum-deposition method previously reserved for computer chips, but they also built the B-1 amplifier, the first to use the new V-FET transistor, turning this technology into a practical audiophile solution. In studios as well as the home, Yamaha has become a standard: the little NS-10 monitor speaker, originally launched in 1978 as a home-use product, was rapidly adopted as a studio monitoring favourite. Many pairs are still in use. Then there’s the 1982 GT-2000 record player, which was all about damping out resonances using sheer mass – the prefix stood for ‘Gigantic and Tremendous’ – through to the next year’s altogether more delicate single-chip solution for CD players. This played a major role in the rapid development of machines by other manufacturers, and the rapid adoption of the CD format. Wherever their efforts are focused, Yamaha engineers just keep on developing better entertainment technology. When home cinema started to boom in the 1980s, Yamaha was already there with its unique Digital Soundfield Processing. It was designed to create an enveloping sound from stereo sources using measurements made in real music venues. It went on to be developed into the Cinema DSP technology you see in today’s Yamaha AV receivers, offering class-leading performance and compatibility with the latest sound formats – the result of decades of research into sound processing. The same digital expertise also makes possible Yamaha’s YSP soundbars. Yamaha invented the soundbar concept, giving 5.1-channel Dolby Digital surround sound from a single enclosure, way back in 2004. The debut YSP-1 had no fewer than 40 drivers to beam sound around the room, all controlled by sophisticated digital processing. More recent models have developed the design to handle the very latest home cinema sound formats. It was a radical home cinema solution then, and the soundbar concept has spread across the consumer electronics industry – but none of the others are like Yamaha’s Sound Projectors. All of Yamaha’s knowledge and vision has given rise to MusicCast, the world’s most flexible and comprehensive wireless multiroom music system, the precursor to which debuted back in 2003. MusicCast isn’t a product, but an integral part of almost 40 Yamaha models, from wireless speakers to systems, amplifiers to AV receivers. It brings these products together into a single home-wide music system, offering simple set-up and Yamaha-quality music throughout the home, all controlled by a fingertip via the MusicCast app. Or, even, without one: as of early October, it’ll be possible to integrate MusicCast with Amazon’s Alexa voice-control technology to select your favourite tunes. Want a particular song or your Sunday morning playlist? You’ll only have to ask! So Yamaha is still right at the forefront of home audio technology. But then, Yamaha has been doing this whole multiroom thing for longer than most – as you’d expect from a company with a history of innovation, it was ahead of the trend on this one, too.